This is hands-down the most excited I have ever been for a Target Collaboration. And I have been excited for them all. I stalked my Target at opening for a week during the Missoni extravaganza; I have pieces from the collabs with Jason Wu, Prabal Gurung, Sam Edelman, Kirna Zabete, and more. It's a great way to have access to high fashion. What is really getting me excited is the handbags. From my memory, no previous collection has truly had a nice array of handbags. Sure there were designer neoprene laptop sleeves, pouches, and totes, but no designed handbags. As you can tell by my picks, I am in love. One, the affordability, two, I am a vegetarian and try my hardest to buy cruelty-free products, so I prefer non-leather items. The colour options for all the bags is great too; they are just stunning. I love the trapeze style bag and am debating whether I like this rich yellow or the also available classic black more. Another thing I am loving is the oriental print, particularly in this shirt dress and pajama set. And, of course, I am lusting after the leather jacket. You can bet I will be outside of Target early morning on opening day, September 15. You can see all the items in the collection here. 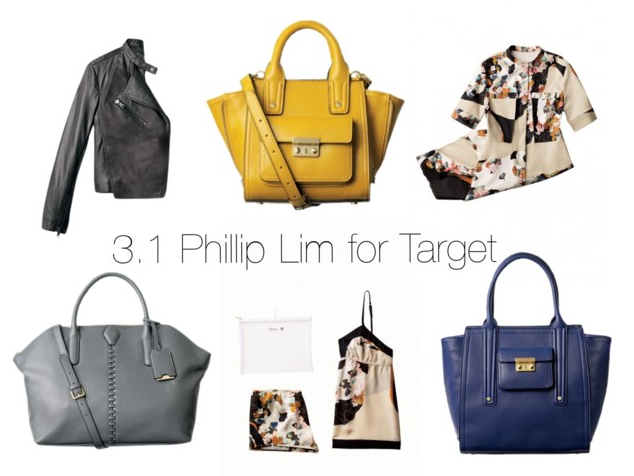 What items are you loving from the Phillip Lim for Target collaboration? Are you with falling for the hype or are the Target collabs not your cup of tea? I did not hear about this, but I am super excited!! Hello jacket! !